X-Press Magazine – Entertainment in Perth – PETER COMBE Live It Up and Fry an Egg on a Slippery Dip!! PETER COMBE Live It Up and Fry an Egg on a Slippery Dip!! Ladies and gents, boys and girls please welcome back Peter Combe to FRINGE WORLD. 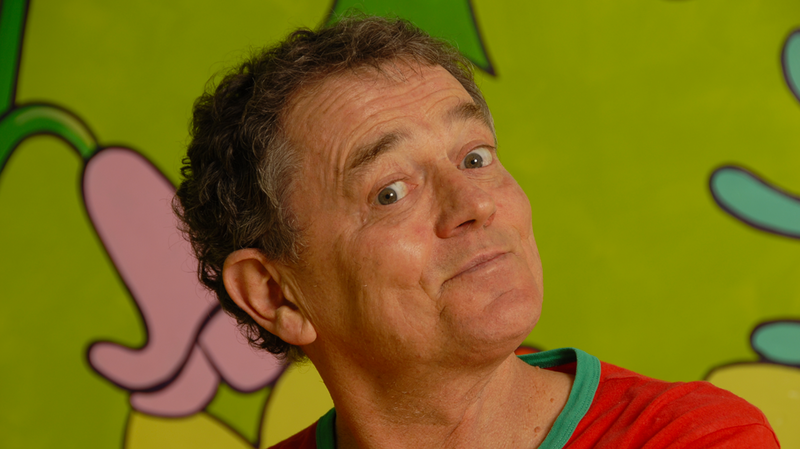 Known for his hits Newspaper Mama, Juicy Juicy Green Grass, Spaghetti Bolognese and Wash Your Face with Orange Juice, Peter has been working on something special for the primary school kids and for the all-time fans who are young at heart. He will be showcasing the new songs from his Live It Up collection. Bring your newspaper hats along to see Peter Combe in Live It Up and Fry an Egg on a Slippery Dip!! at The West Australian Spiegeltent, February 16 & 17, 2pm. MICHELLE PHAN caught up with Combe to talk about the Live It Up collection and shared a bit of his life and a piece of his heart. Showcasing your new songs from your Live It Up collection, can you list us your top five favourite songs? Live It Up, Mr Spool, All of the Dinosaurs, The Planets, Sun Comes Up, Sun Goes Down, Carrickalinga. Where did you draw inspiration from for this album? Has your views/ focus shifted from the previous albums you’ve made in the past? Inspiration always comes from observing what goes on around me. This is an album more for primary aged kids (5-11) whereas my first few albums were more for 3-8 year olds. Primary aged kids are the ones who tend to be ignored by songwriters. What should the audience bring with them to the show? Any suggestions? A newspaper hat would be great! Newspaper Mama will be in the show! Was it always your goal to be a children’s entertainer? No, I travelled to London in 1977 wanting to be the world’s next Paul Simon. A humble aspiration!! However, my teaching background and quirky sense of humour propelled me in the direction of writing and performing for kids, something I’ve never regretted. Give us a snapshot of Peter Combe’s life (what is it like where you live and what’s your daily routine like)? I live in a suburb of Adelaide. I’ve been in the same house for 47 years, apart from living in Sydney (1975/76) and England (1977-79 and 1986) for a few years. My daily routine is get up, make a cup of tea for my wife Carol and myself, then a piece of toast with avocado, go for a run (I run four times a week) check my emails and then depending on what ‘phase’ I’m in, begin or continue organising concerts, DO a concert or start/continue writing a song, or do some boring admin on my laptop. Good people, famous or unknown eg. Mahatma Ghandi, Martin Luther King, an old lady I know who looks after her husband who has dementia and an autistic son, Paul Simon, John Cleese, David Attenborough. Keep fit, respect your audience, maintain a sense of humour. With people like Donald Trump in charge, you need to! Probably the most important reason though is I love what I do and want my songs to bring joy to people. How do you come up with fun, educational songs? I observe what’s going on around me, I am always on the alert for a good song idea and when I get one, immediately write it down or make a rough recording of it. For example Spaghetti Bolognese came when watching some kids at school playing marbles but sometimes songs just come out of nowhere and you can’t explain how you got the idea eg. Newspaper Mama, Wash Your Face in Orange Juice. This is part of the mystery of songwriting, not knowing where an idea has come from, but eternally grateful that it has! Finally, can you please draw us a picture of bellyflop in a pizza? I won’t because I’m very bad at drawing. Sorry.